In this issue we bring you part one of our coverage of the Historic Car Week in Monterey. 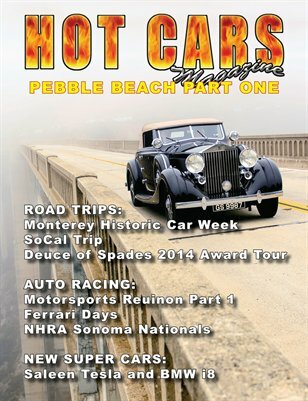 Our coverage in this issue includes the Thursday tour down the Pacific Coast Highway, Motorsports Reunion & PB Concours! We celebrate road trips with a trip to SoCal to visit Surf City Garage and the Classic Chevy Show! And we catch up with Faith Granger on her road trip up the coast promoting her movie "Deuce of Spades". Our race coverage includes Ferrari Days and the NHRA Sonoma Nationals! Plus we take a look at two new Hybrid Super Cars!